These two birds illustrate a convention in the use of capitalization and hyphens in their names. Why not Night-Hawk and Nightheron, or nighthawk and night heron? In preparing an article for a popular publication I encountered a problem when I wrote of the Black Rosy-Finch, but the proofs came back as "black rosy finch," suggesting that I must have had difficulty in deciding the color of the finch. The simple answer is that, in North America, the American Ornithologists' Union (AOU) has established "official" common names. They are capitalized if used to describe a distinct species, and follow general rules. For example, if the compound name of a bird describes its taxonomic classification it is hyphenated, but if it describes a characteristic (such as the behavior called "hawking" insects), there is no hyphen. 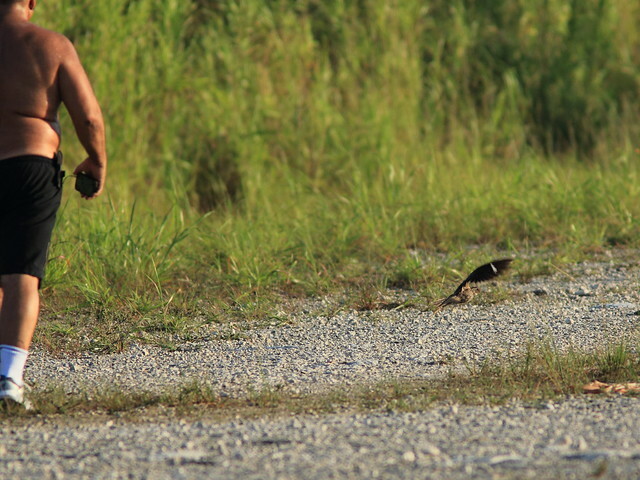 Hence, we have "night-heron" and "nighthawk," and "Yellow-crowned Night-Heron" and Common Nighthawk. There are exceptions for some names that have been in use for a long time (such as goldfinch instead of gold-finch). At sunrise the day after we arrived back home to Florida, we walked the gravel road into our local wetlands. It was warm and humid. This and the relative lack of bird song suggested that spring was over and the summer/rainy season pattern was now in place. 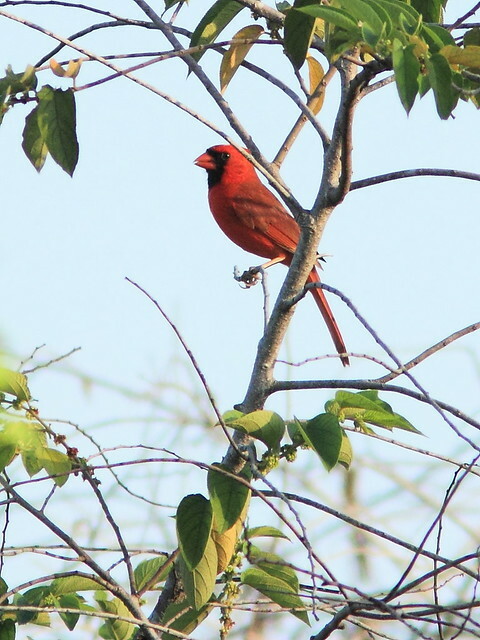 Mockingbirds and this Northern Cardinal broke the silence. 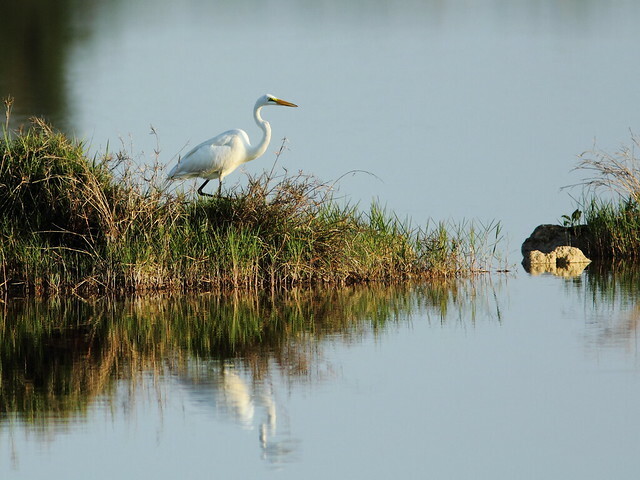 The air was calm, just perfect for capturing the reflection of this Great Egret. 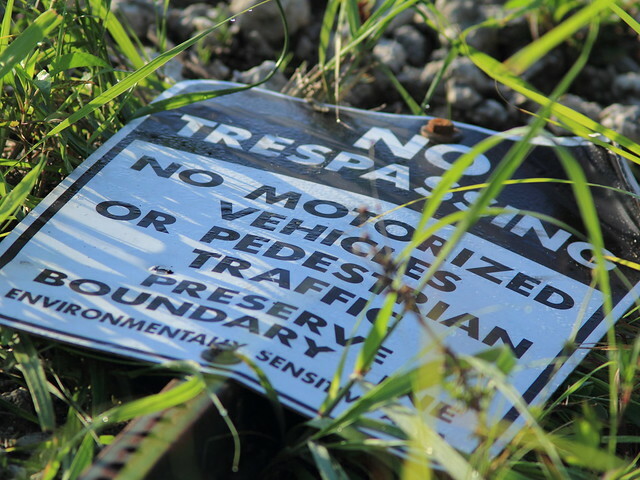 I was disappointed to see that the recreational off-road vehicle drivers had not only knocked down the "No Trespassing" sign but had dragged it out into the road, as if to flaunt their indifference. 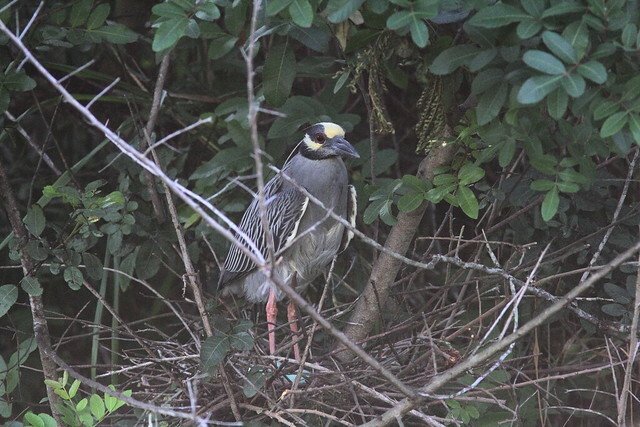 After walking the full length of the mile-long road, I pushed on to check up on the Yellow-crowned Night-Heron rookery, as I was anxious to see what had happened there since we left for Illinois a month previously. At that time I observed courtship and recorded the locations of nests under construction. I assigned a number to each nest, relating it to the position of the 30 regularly spaced live oaks that had been planted along the near side of the canal. The numbers run from north to south. As I proceeded northward along the side of the canal opposite the rookery trees, I found four active Yellow-crowned Night-Heron nests. The first (#22) was in a new location and contained two nestlings. Look closely to see the red eye of one of them (click on photo to enlarge). A third nest (#13.5) was in the same location as in the previous year. I had re-found it the month before but now it was entirely obscured by vegetation, though I saw fresh whitewash and could discern some movement that indicated it was still active. My neighbor Scott photographed four chick at this nest the week before. 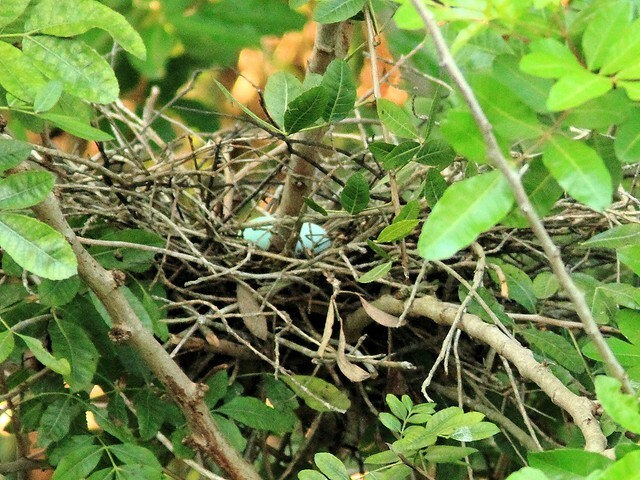 A fourth nest (#10) contained two or more blue eggs. Like the first, it was over the water and quite exposed to view. A fifth nest (#9) was one from last year being reconstructed by a pair when I charted it before leaving for Illinois a month before, but it had disappeared. The sixth nest (#4.5) was near the far north end of the canal, in a new location. The month before I had found an occupied nest out in the open only a few yards north of it, but now it was gone. Perhaps a storm (or vandals) had destroyed it and the nest pictured below represented a second attempt. It also contained eggs. Another nest (#2.5) that was under construction a month ago had also disappeared. 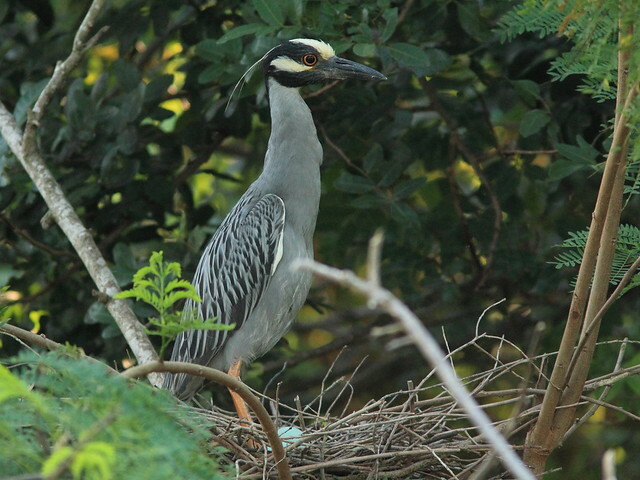 Last year six pairs of Yellow-crowned and three pairs of Green Herons nested in the rookery. 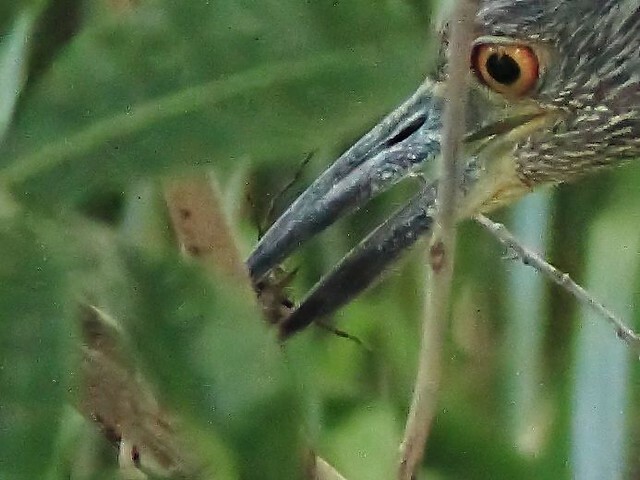 Green Herons are more secretive, and their nests are easy to miss. 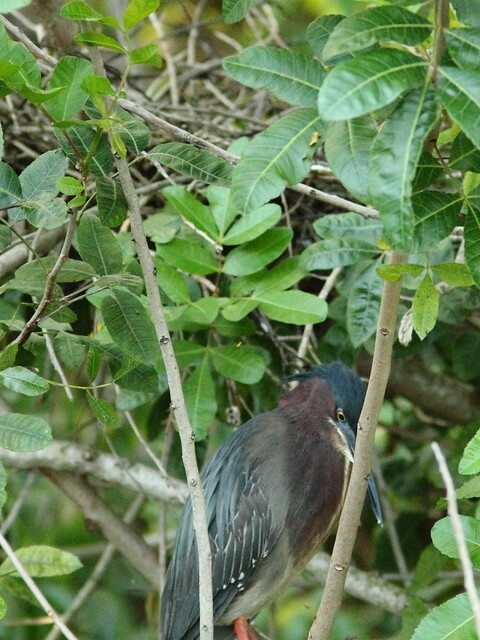 I found one new Green Heron nest at #5.5 but could only see movement through the leaves and hear one or more nestlings' begging cries as it was being fed by a parent. 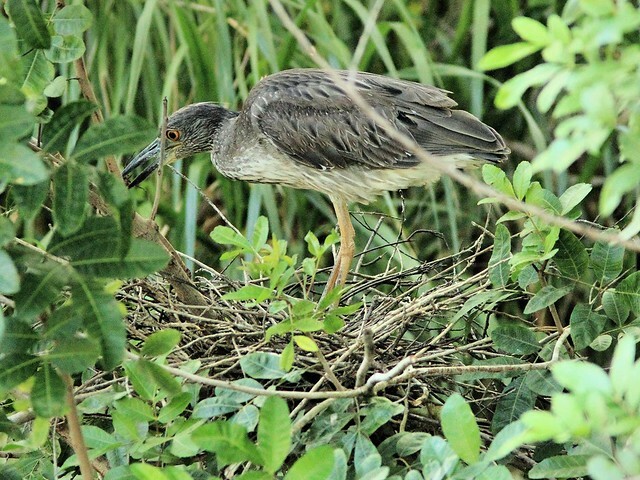 A second Green Heron Nest (#20.3) contained eggs on May 25. However two days later it was empty and an adult male Green Heron was roosting next to the nest but did not enter it and soon flew to a nearby branch. This male in breeding condition has bright reddish legs as opposed to the yellow-orange legs of the females. 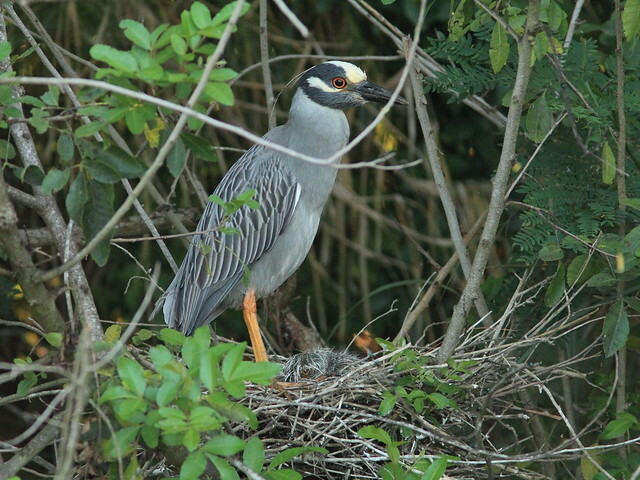 Suddenly, a very young immature Yellow-crowned Night-Heron appeared on the nest and began eating something. It probed in the nest and I took many photos it an attempt to see what it was eating-- the eggs of the other species? Only one photo gave any clue, as it appears clear that at this point the young intruder was eating some kind of insect, possibly a large beetle. Here is a close-up of the insect in its bill. So far I have identified these five active Yellow-crowned Night-Heron and two Green Heron nests. 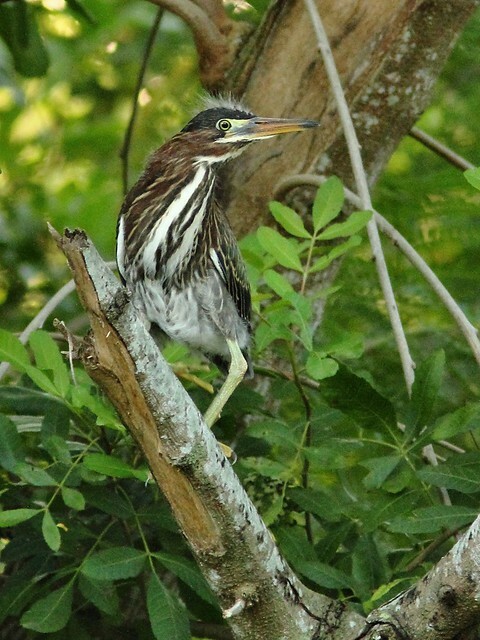 I found three fledgling Green Herons that I could not associate with any particular nest. 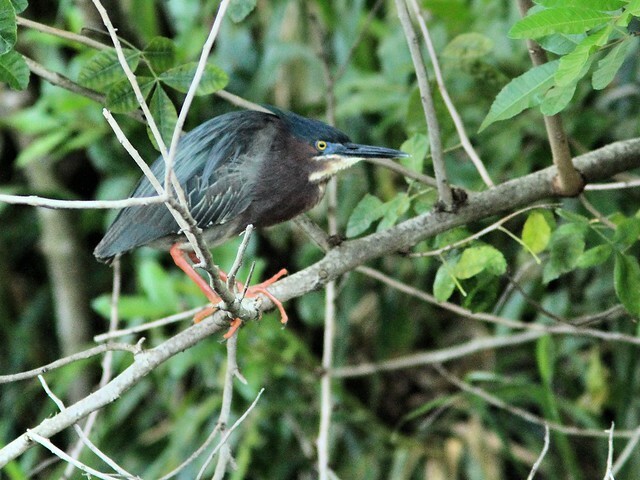 The streaked breast and the presence of a tuft of natal down identifies this Green Heron as a juvenile. At least one other pair of adult Green Herons was present. It is quite possible that I missed some nests and will keep looking. 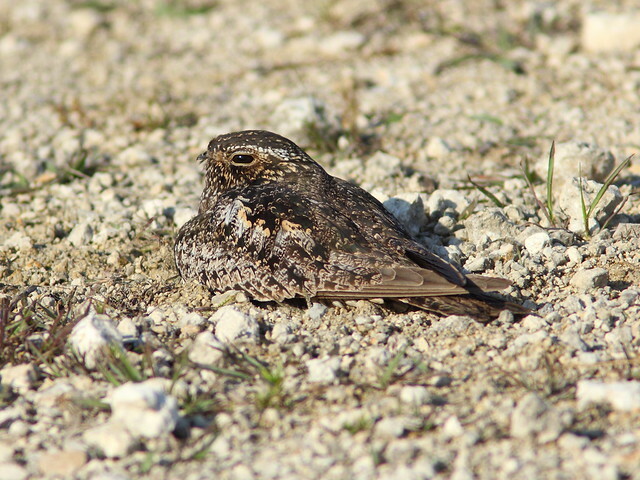 On my way back home I observed interesting behavior on the part of a Common Nighthawk. Last month I suspected that a pair of nighthawks was planning to nest in this area, and now saw that one of them was flying short hops just in front of a walker, evidently in an attempt to lead him away from the nest. 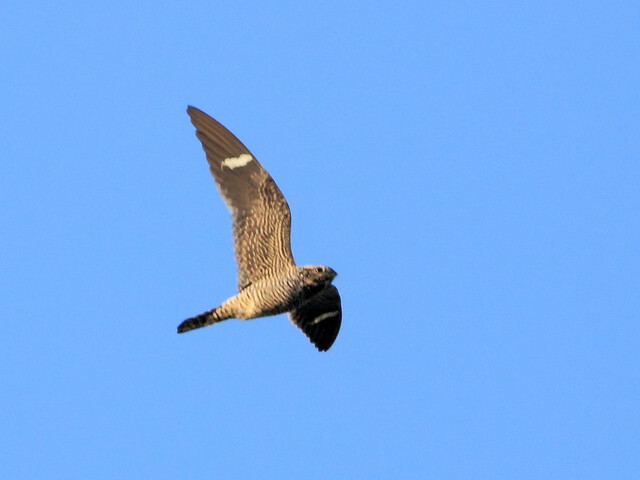 I quietly watched as the nighthawk returned to a spot that I assumed may have been the nest site. 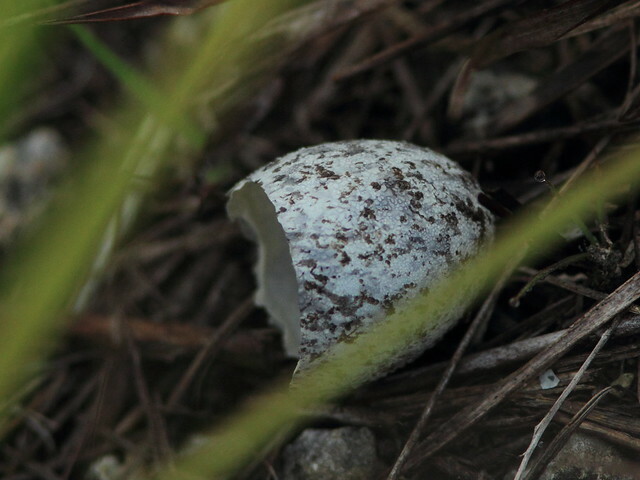 Being very careful about where I planted my feet, I ventured a short distance off the side of the road and saw an empty egg shell but no evidence of a hatchling. Of course a baby bird could well have been right in front of my eyes as they are so well camouflaged. In the meantime the nighthawk landed a short distance away and waited for me to depart. As I left it actually walked (almost ran) in front of me before taking short flights as I followed it away from the nest area. magnifique article avec de superbes photos ! Wonderful shots with lots of great info. The sign post is a common occurrence all over. Gets my blood boiling how disrespectful some people can be. While birding on Friday, the car had a conversation on hyphens in bird names - nice to know we were not the only ones thinking about it! Also very exciting knowledge regarding nesting behaviors of herons as I was just wondering about that the other day as well.